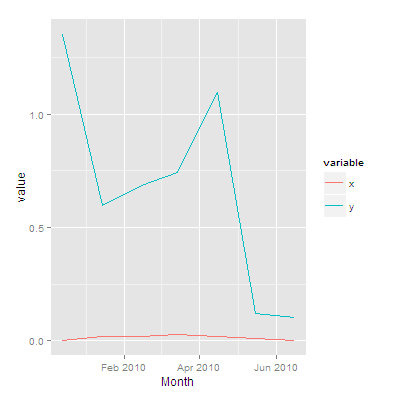 I'd like to know how to make it so that x and y, in the following example data set are plotted on the vertical axis for each element of frame in the horizontal axis. How do I do this with ggplot2? I've been able to get one plotted in a line, but it seems that it's not recognizing my frame as categorical (not that it is, nor do I know how to change it to such). This is a rather late answer, but if you want your frame variable intepreted date (month of the year), then convert it to a date.